If you\'re using Eyes for Better Heads, some of the Dunmer have yellow eyes by default. This makes the yellow eye into a darker red. To quote the readme of EYES for Better Heads, credit belongs to: the Better Heads team, Rhedd, Arathrax and Gorg; and to Mighty Joe Young for the original eyeball texture. In addition, credit goes to Phaedrus for making EYES for Better Heads. 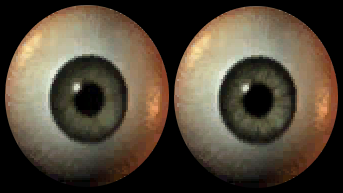 This is a simple modification of the textures (and a few meshes) that come with EYES for Better Heads. In the original textures, there are two used on Dunmer, one of which is red, and one of which is yellow. While they look good, I like the idea of Dunmer eyes just being red. Knots made a small modification where both textures were just that of the red eye included. I thought things would look a little better if there was that red eye texture and a darker red one, so I edited the red eye a bit to get something a little different for that second texture. The only changes to these files are which eye the eye meshes display. Simply changing the yellow eye to red changes a few of the Altmer eyes to the same color, and if the Dunmer having yellow eyes bothers you then Altmer having dark red eyes probably bugs you too (which I didn't think about with the first file I uploaded-- my bad). The colors are changed to something more appropriate, two of them are hazel, one blue, one green, and one yellow. They should look fine. The difference between the two archives are the included textures. 'Red Dunmer Eyes' simply makes the yellow eye a darker red. 'Red Dunmer Eyes - Extra Detail' slightly edits most of the eyes. None of the eyes look incredibly different in this one, they simply look a bit more, well, detailed. The textures are uncompressed, so there's no loss in quality, and the files are not that much larger. It's possible you could get a bit more lag from using this, but I find it highly unlikely so you should just try the one with a bit more detail first and use the other if you see any decreases in framerate.